Norge as it is called in norvegian (or swedish or danish) covers the west side of the Scandinavian peninsula. 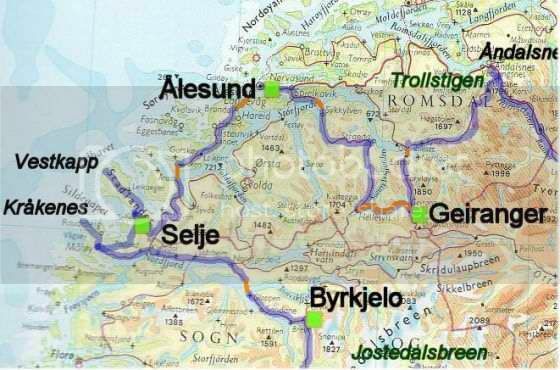 The name is said to derived from Old Norse norðvegr, meaning "the northern route". The photos on the web pages comes from a trip made 2003 in four central regions, the county of Hedmark, Oppland, Möre og Romsdal, Sogn og Fjodarene -- the last two at the atlantic coast.